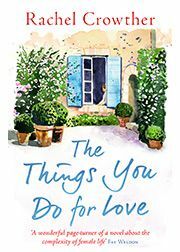 Alumna Rachel Crowther’s second novel The Things You Do For Love will be published on 11 August and is now available for pre-order on Amazon and elsewhere at £7.99. The cover is pictured on the left. Focusing on how we tell the stories of our lives and about our capacity for love, the book follows a recently retired and widowed doctor, Flora, as she comes to terms with her new life and with the ups and downs that her two daughters face. Richly woven through with art and music, it is a page-turner of emotional depth, eloquence and wisdom. Retired and widowed in the space of a few months, Flora is left untethered. Travelling through France, Flora meets a wine merchant in the Loire Valley and agrees to swap houses with him for the summer. In the dusty setting of St Rémy, she begins to construct a new kind of life for herself. When each is devastated by a personal crisis, they flee to France to join their mother, and the stage is set for the family’s secrets to be uncovered at last. Rachel was at Clare 1983-86 and read Medical Sciences followed by Social and Political Sciences for Part II. An enthusiastic member of the Chapel Choir, she also rowed a little and was president of the Clare Lobsters, before going on to Barts in London to finish her medical training. She went into Public Health and worked in the NHS for twenty years before succumbing to a lifelong yearning to write fiction, previously indulged during successive bouts of maternity leave.